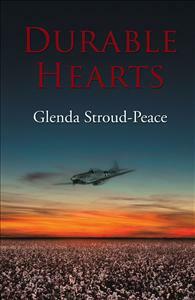 Durable Hearts weaves together the stories of several Alabama Wiregrass farm families, from the Depression to the post-World War II era, and explores the effects of the Creek War of 1836-37 and the Civil War upon the Wiregrass. Theora Waldron, granddaughter of a black preacher, and Nolly Knightley, a white cotton farmer’s daughter, are friends whose relationship survives the exodus of Theora’s family to Chicago and Nolly’s migration to Daytona. Sharecropper Leonard Cauley struggles to escape his hard existence, while prosperous Benjamin Tomlin seeks a life beyond Comfortroot Farm, unaware they will soon be participants in a global conflict.